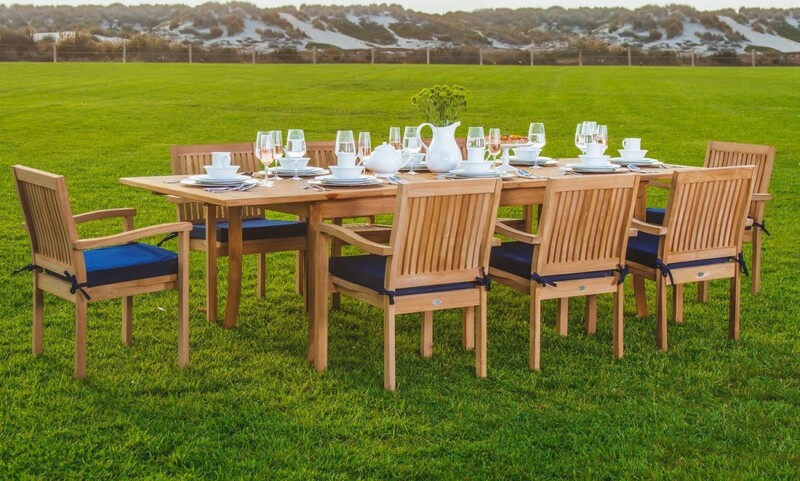 The WholesaleTeak 9 Piece Grade-A Teak Outdoor Dining Set with 94″ Table and 8 Stackable Chairs is a large, elegant, great-value dining set that can comfortably seat up to 8 guests in style, thanks to its 94-inch solid teak extension table and 8 teak armchairs — all of which can be folded down and stacked to save space when not in use, which also makes for easy storage. 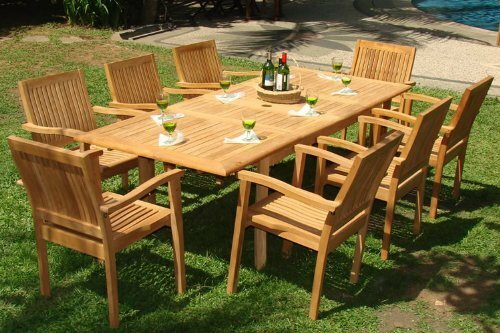 Constructed from solid Indonesian, plantation grown, Grade-A teak, which is regarded as being the highest-quality teak wood available in the world today, the WholesaleTeak 9 Piece Grade-A Teak Outdoor Dining Set with 94″ Table and 8 Stackable Chairs is finely-crafted with artisanal mortise and tenon joinery and wooden dowel pins, and apart from the table’s 2 bolts and 2 washers to secure the table’s legs, is made from 100% solid teak wood with no additional hardware. 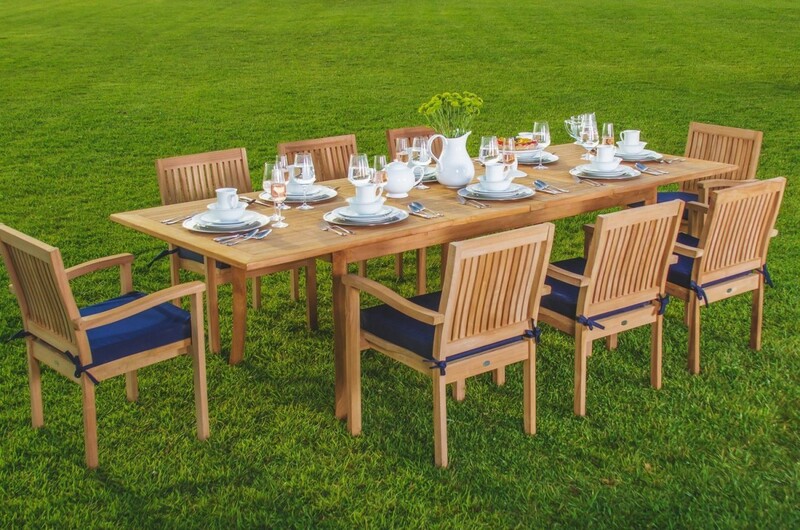 Featuring a gorgeous, 94-inch long solid teak table with butterfly leaf extensions, which can be folded down to just 71-inches to save space when not in use, the WholesaleTeak 9 Piece Grade-A Teak Outdoor Dining Set with 94″ Table and 8 Stackable Chairs provides lots of flexibility when entertaining, and by simply pulling each end of the table’s top, you can instantly accommodate extra guests in a snap. 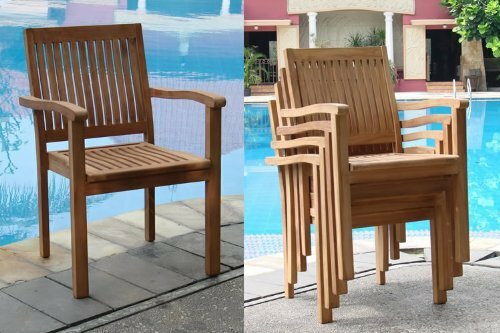 Also featuring eight stackable teak armchairs, which are great for easy off-season storage, and which include elegant, gently-sloping arms and slatted seats and backs which are comfortable with or without added cushions, the WholesaleTeak 9 Piece Grade-A Teak Outdoor Dining Set with 94″ Table and 8 Stackable Chairs provides ample space to enjoy outdoor dining and entertaining with family and friends, and is sure to be an inviting centerpiece for your patio, deck, garden or yard that will attract many compliments. Arriving fresh in its natural form, with no sealer or treatment applied, the WholesaleTeak 9 Piece Grade-A Teak Outdoor Dining Set with 94″ Table and 8 Stackable Chairs can be preserved with teak oil once or twice a year, which will also bring out the color of the wood (around a gallon should cover a set of this size), or you can alternatively just leave it bare, to weather to a silvery-gray patina. Either way, as teak wood is naturally resistant to rot, moisture and UV radiation, treatment is optional. 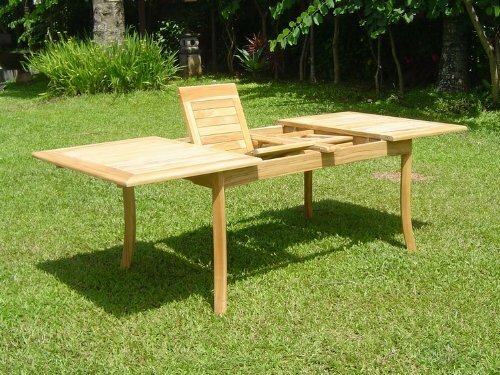 Also including a 2-inch umbrella hole in the table (which can be used with the butterfly extension open or closed), and a wood umbrella hole plug for a flush finish when not in use, the WholesaleTeak 9 Piece Grade-A Teak Outdoor Dining Set with 94″ Table and 8 Stackable Chairs is quick and easy to assemble (the chairs arrive stacked and pre-assembled, so you only need to attach the four table legs), and is available over at Amazon.com (rated 3.7 out of 5 stars from 9 customer reviews). Click to see current price.